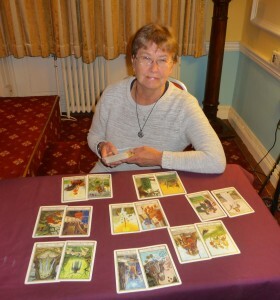 Sue has been studying, reading and teaching the tarot for over 30 years. 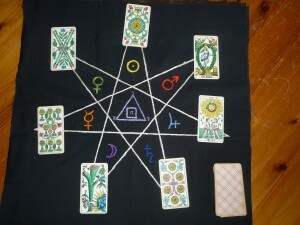 Tarot cards laid out in an astrological pattern, based on the seven visible planets. I learnt to understand the magical symbols on tarot cards from a wise teacher of the Hermetic Arts many years ago. The cards you can see here in the photo belong to the Classical Tarot, which was my very first pack of tarot cards. A tarot pack consists of 78 cards, of which 22 are the Major cards, which represent universal archetypes or drives in life. The other 56 cards are the Minor cards – based on the four suits of playing cards plus one extra per suit – which ‘fill in’ the important details in a reading. If you are familiar with more modern packs such as the Rider-Waite, you will be aware that all the cards in that pack and its derivatives have illustrations. You will notice that these classical cards do not have illustrated Minor cards, but are simply shown as six Pentacles, eight Cups and so on. That was how I learnt to understand numbers, and the four elements represented by the four suits. I approach readings for people with a view to doing my best to translate the language of the tarot into a comprehensible message. I shuffle the cards with you in mind, and hand them to you to shuffle, or cut as you choose, putting your energy into the cards, so this reading is clearly for you. I then take them back, and lay them out in a pattern of choice. I believe that tarot cards mysteriously mirror what we have in our subconscious minds and in the circumstances that surround us at any given period. The cards do not tell us what we should do, but give indications of what needs to be addressed, and possibly changed, in order to move towards the best possible outcome. I do not give advice, as advice given to you by anyone else, even by the tarot reader, is not useful. Instead I interpret the wisdom contained in the combination of tarot images. I will tell you what I see, and I try always to do this with compassion. I believe also that tarot cards are never negative, but come from a position of light. True, there are images that seem disturbing, such as the Death card (which means transformation) or the Tower (breakdown of circumstances or breakthrough, awakening). Life is not always rosy and wonderful, but sometimes we humans go through difficult patches – but there is always a way through. This is what the tarot can do, it can show you another perspective on your situation, whatever that is. Many people who have a reading gain new insight into their next step. I love to communicate with others through my teaching practise. I took a Masters degree some years ago at university in order to enhance my knowledge of history of magical symbolism. I have an MA in Cultural Astronomy and Astrology, which explored not only the background and the current approaches to astrology, but also led me deep into researching related esoteric subjects, especially the mystery of tarot imagery and its evolution. My dissertation – for which I received a Distinction – was on the subject of comparing the rapid evolution of tarot and astrology during the nineteenth century leading into the twentieth, when both subjects were woven ever more intrinsically together in the ancient Western Mystery Tradition. 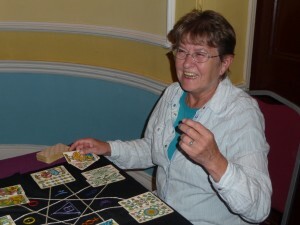 In addition, I have studied and meditated to develop my intuition through psychic studies, and have created a way of teaching that involves using guided imagery journeys to deepen my students’ own personal connection with tarot cards. I blend these experiences with giving my classes a thorough understand of the meaning of each card. Further details will be posted soon on Treadwells’ website, and on this website, on course content, plus dates. from 22 September – 13 October 2018 (4 x consecutive full day Saturdays) See Sue’s Diary page. To book or enquire, LSA contact details are on this link. I spoke on the Influence of the Minor Card Images at the UK Tarot Conference, held on 8 and 9 October 2015 in London. http://tarotconference.co.uk/ Enquiries or bookings for the Conference 2017 should be made through the website or by phone with Conference organiser Kim Arnold and her team. Check out this site again soon for more news..
To book a tarot consultation in person or by Skype, see Consultations.